Learn all the tips and tricks to create truly reversible colorwork in both half double crochet and double crochet with my book, Reversible Color Crochet! 1. 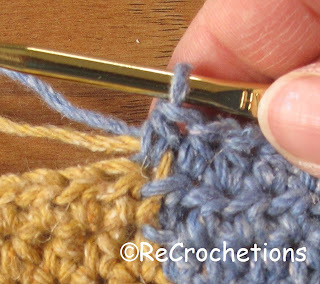 Before a Late Color Change, on an increasing angle, carry second color of yarn under last stitch in first color. 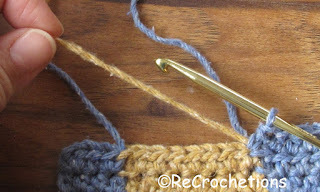 This pulls the new color up to the same position as it would be in Tapestry Crochet, ready to pick up for next stitch. 2. Complete last stitch in first color for Late Color Change before dropping first color to back of your work, ready to pick up on your way back on the next row. 3. Pull carried yarn tight to hide it under stitches. 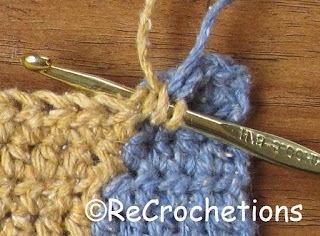 Then use this yarn to complete the first stitch in the new color, with the old color on the top loop of the stitch. 4. For Chunky Wt. 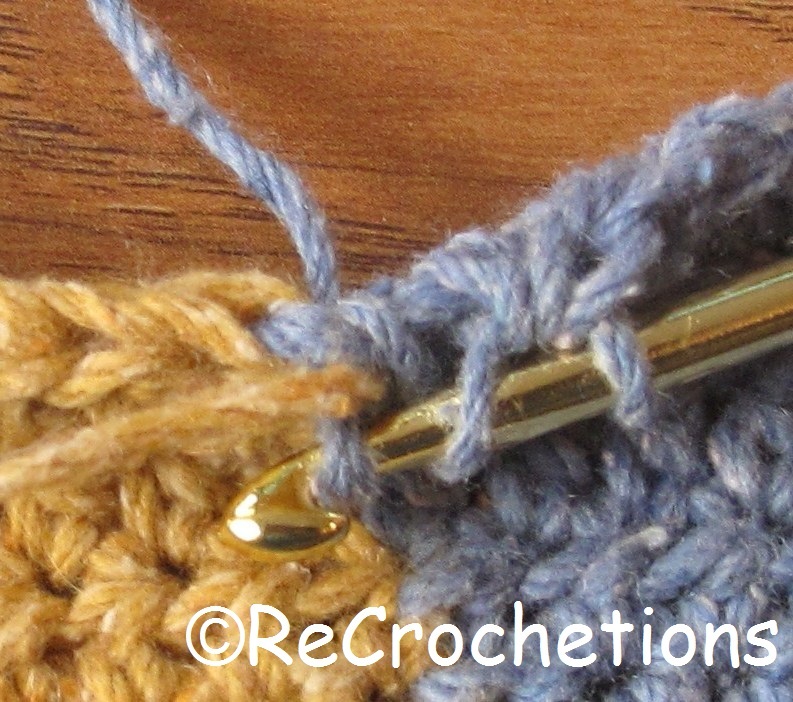 Yarn Only: When working back in other direction insert hook under carried yarn and front loop only (flo) of Late Color Change. This last step avoids holes in fabric with chunky weight yarns (as used in Happy Day Playmat), but I have discovered, is not necessary with worsted or lighter weights. 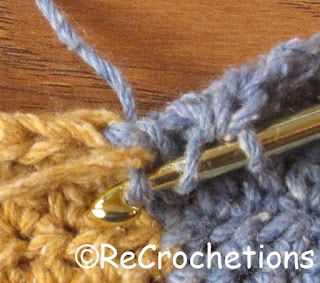 For lighter yarns insert under carried yarn and both loops. 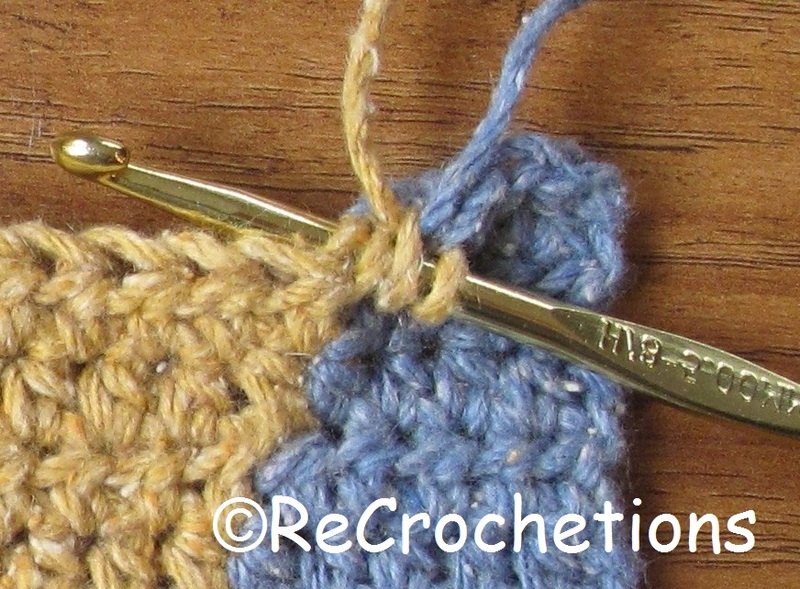 Although working Late Color Changes in Reversible Intarsia Crochet are not the first stitches taught in my articles on Reversible Intarsia, we started here because this is one of the factors most different from typical crocheted colorwork. I want to offer more step-by-step visual instructions as most of my testers found the visuals very helpful for this part. My question is how did you get the new color around the prev hdc? This is the only part I am having trouble understanding.